Following Malaysia Airlines' exit from Brisbane in late 2015, the Sunshine State's capital has been without non-stop Kuala Lumpur flights, but Malaysia-based airline Malindo Air is looking to change that: dipping its toes in the water with a new Brisbane-Kuala Lumpur service that routes via Denpasar (Bali), Indonesia, with affordable business class fares from just $2,200 return to attract business and leisure travellers alike. Currently served with a Boeing 737 while demand grows, that could soon become a non-stop Airbus A330 flight without the Denpasar detour – but until that happens, here's what you can expect to find at the pointy end when flying Malindo Air Boeing 737 business class on a return trip from Brisbane to Kuala Lumpur. Frequent flyer program: Malindo Air doesn't have an Australian airline partner and isn't a member of a global alliance, but its own Malindo Miles scheme is free to join. Carry-on baggage allowance: 2x115cm bags, plus a laptop bag or handbag as a third piece, up to a total overall weight limit of 10kg per passenger. Priority check-in: Business class check-in lanes are clearly signed in both Brisbane and Kuala Lumpur, with travellers also having access to in-town check-in when departing Kuala Lumpur and taking the KLIA Ekspres train to the airport. Priority passport control, security, boarding: Show your business class boarding pass at Malaysian passport control on both arrival and departure for access to the business class fast-track lanes, next to the APEC Card and Diplomatic Passport desks. For whatever reason, Malindo Air does not provide Express Path cards for use at Brisbane Airport, but the 'regular' queues on departure and when returning home were short. 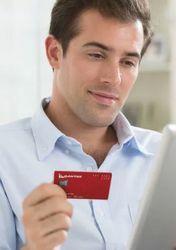 Corporate travellers: Malindo Air doesn't accept American Express or Diners Club cards when buying tickets via its website, but you can use these cards to book your Malindo Air flight via travel agents like Expedia. As Malindo Air is currently building a new lounge of its own in Kuala Lumpur, travellers can choose between access to one of two temporary lounges (the KLIA Premier Access Lounge or the Sama Sama Express Lounge), or a 30MYR (A$9) food and beverage credit to spend at various food outlets in the meantime. ... but which proved to be little more than a dark room in the corner of a hotel lobby, with access to power from only a few specific seats. Shower facilities, WiFi, machine-made coffee, buffet dining and a small selection of alcohol were all available, however, with a (paid) dining menu also at-hand for hungrier travellers. Lounge access isn't offered in Denpasar when in transit, as you remain on the plane while cleaners zip through the cabin: avoiding the need for an Indonesian transit visa for Australian passport holders, at least. With business class fare prices between Brisbane and Malaysia less than half as expensive as Malindo Air's major competitors, you won't find fully-flat beds here, or even angled-flat beds. Instead, three rows of reclining seats in a 2-2 configuration, with 45 inches (114cm) of pitch: the measurement from your headrest to the same place on the headrest in front (or between two other identical points). High flyers might recognise these as being similar to Virgin Australia's Boeing 737 business class seats, such as you'd find zipping between Sydney, Melbourne and Brisbane, and also between Brisbane and Bali: yet with a few distinct differences. ... and the seat's features, including recline, lumbar support, the legrest and the footrest can be controlled via the opposing armrest, which also houses the tray table. The lever controlling our footrest was broken on our Brisbane-Kuala Lumpur leg, but being a daytime flight where work was the priority, we were still able to get comfortable using the other remaining controls. Malindo Air also has personal adjustable air vents above every seat, which we always appreciate. Shortly after take-off, your choice of breakfast or an early lunch is served. There are no printed menus, but the crew come by to offer either an "omelette with sausages" or "rice with chicken". Given our 4:30am wake-up call for this flight and that we'd already eaten breakfast in the lounge, we opted for the latter, served with fruit and a bread roll. It proved tasty enough, but we wouldn't award any extra marks for presentation, and the portion sizes of the chicken and vegetables were quite small. If not for the tableware, this could easily be an economy class meal on many other international airlines. We're not offered any snacks throughout the flight, but just when we start to think "hmm, I could really go for something to eat" closer to the first landing in Denpasar, a warmed muffin appears, and we take the chance to order some wine. There's no wine list, and the options given are "red or white". The latter proved acceptable, but one glass was ample. 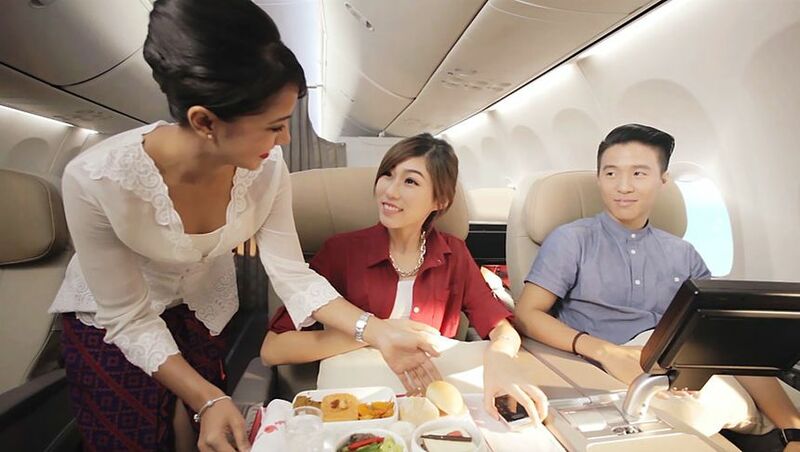 While on the ground in Denpasar, there's no food or beverage service, but closer to take-off, pre-departure drinks are again offered, and lunch is served once en route. Choices given were "chicken curry with white rice", or nasi kuning: an Indonesian dish centred on yellow rice. Given that's where we were flying from, it seemed like the fitting choice, and came with a small side salad, a croissant and a piece of sponge cake. Again, presentation of the main course was very 'airline meal' – clearly heated in the same dish it was served in – but we'd have loved something to spread on the croissant like jam or butter. On the journey home, an evening departure from Kuala Lumpur finds dinner served after take-off, beginning with a glass of wine and some mixed nuts. Being business class, those nuts would be better-served warmed in a small bowl, rather than at room temperature in the usual foil packaging, for a more 'premium' touch. For the main course, there's a choice of chicken biryani or chicken lasagne. We chose the former, and again, while we'd not award any extra points for presentation, the food itself was surprisingly delicious. Given that a full dinner is served on the first leg home and that the onward flight departs Denpasar around midnight Brisbane time, we were surprised to find a second round of dinner being served as the next leg began. We opted out, hoping instead to maximise our rest, but were also surprised to find no breakfast or coffee served prior to landing – not even a muffin, bagel or a piece of fruit – with the only snack offered being another bag of mixed nuts, which we declined. That might suit travellers who joined the journey in Bali and chose to eat a midnight dinner only a few hours prior, but when you're taking the full flight from Malaysia to Australia and doing your best to sleep without access to a bed, arriving at your destination feeling hungry isn't a great way to end an international business class experience. During waking hours, a selection of movies, TV shows and games can be accessed through an 11.1-inch touchscreen monitor, which folds out from within the centre armrest and can be swivelled and tilted to your preferred viewing angle. It responds to touch much more like an iPad than a typical airline monitor, so gentle presses get the job done rather than hard jabs. Panasonic over-ear headphones are provided for use with the inflight entertainment system, but lack noise-cancelling functionality and the audio quality produced wasn't great either, with sound also in only one ear on our particular pair unless fiddling with the cable. Cabin crew on our Brisbane-Kuala Lumpur flights were helpful but distant, seen only at meal times, but always responded within 10 seconds when the call bell was pressed. On the return journey, crew were much more attentive and frequently stopped by to top-up wine and water glasses, without the call bell needing to be pressed. Small amenity bags were distributed, containing slippers, an eye mask, a dental kit and a comb, with 'Batik Air' branding: Batik Air being Malindo Air's sister airline, with Malindo Air to be rebranded as Batik Malaysia later this year (and Batik Air as Batik Indonesia). Overall, the idea of flying a Boeing 737 from Australia's east coast to Malaysia mightn't appeal to every traveller, but for self-funded flyers or cost-conscious businesses, Malindo Air represents a value choice compared to its more expensive competitors. On daytime flights such as outbound from Australia, the lack of a bed isn't a major issue if the aim is to stay awake and get work done or to recline with a good movie, and would be a more than acceptable option on shorter regional flights within Asia as well. Where you'll notice the difference is on the overnight journey home, where being able to lie flat and sleep would be most welcome, as would a non-stop flight to avoid staying awake while in transit. But speaking of sleep, the final Bali-Brisbane leg of the trip wasn't at all conducive to getting some: not just because of the seat, but due to the constant, loud interruptions over the aircraft speakers. While waiting to take-off and soon thereafter, pop music was cranked up throughout the plane: annoying in itself, especially at what was midnight Brisbane time, but over the course of the return journey, I'd heard the same handful of songs no less than 16 times each (I was counting...), which is simply ridiculous and had me wishing I'd packed ear plugs. That's because the same music was played in the same order on boarding, after pushing back at the gate, before landing, and then again at the gate at every stage of the journey, and while I must admit to liking the movie Pitch Perfect, there are only so many times you can hear "Flashlight" in a 48-hour period without wanting to hold your fingers in your ears until it stops. I fell asleep once more, to be woken again to an announcement that the cabin lights were now being dimmed to help us sleep. Why they'd been at full fluorescent white for the first half of the journey is another matter, but there's no need to announce something that can be done quietly (and probably should have been done earlier). Yet again, I went back to sleep to be woken a fourth and final time, to an announcement merely reminding of our flight number and destination. At this point, if you're on the wrong flight, you really just have to go with it! I was lucky to have managed two hours of sleep on the entire flight – about all I'd expect to get further back in economy – and if I'd not donned my eye mask and had my idle, over-ear Bose QC35s switched to full noise-cancelling mode throughout, I'd have been lucky to sleep at all. Malindo Air's CEO has previously told Australian Business Traveller that the airline could upgrade three of its seven weekly return KL-Brisbane flights to non-stop Airbus A330 services with beds at the pointy end “as early as December, if not a little sooner”: but until that happens, a few easy changes on the airline's part regarding cabin announcements and inflight lighting would do much to help travellers sleep aboard the Boeing 737. But, as we often say, you do get what you pay for: and at $2,200 return from Brisbane to Malaysia, I'd still fly with Malindo Air again: but perhaps with some solid ear plugs tucked into my cabin bag, in the hope of getting some sleep on the way home! Chris Chamberlin travelled to Kuala Lumpur as a guest of Malindo Air. I flew Malindo a few weeks back from DPS to PER. I managed to snag a business class fare (one way) for $280. While to food was pretty ordinary, and there was no alcohol offered on the flight, for the price the extra space of a business class seat was fantastic value. Was this an upgrade offered at check-in? No - it was a promo fare booked online. Just lucky timing! Sounds and looks pretty amateurish. I'd really struggle to justify the additional cost over a Y fare on SQ or TG. Another option is Air Asia out of Gold Coast - a reasonably comfortable lieflat bed is offered and OOL to KUL return can be had for $1000-2000 at most. Food and service is poor and I can't remember if they had inseat power or another amenities (I slept the whole way last time). But cheaper than Malindo and has a bed. This is an extremely well written review, perhaps one of the reviewer's best ever - especially the comments at the end about constant in-flight announcements that are spot on, although the 'lights dimming' comment may be to warn passengers - but I agree, no need for it and very annoying if somehow in a reclining airline seat you've managed to nod off, a feat in itself. Mr Chamberlin, could you please in time travel on Philippine Airlines out of Melbourne or Sydney, hopefully on a day (which is now almost all) when the altered Airbus A330-300s are used as they have lie flat beds in J and a four across configuration? This airline flies out of Australia a lot more than Malindo Air but seems to get little or no attention by reviewers like yourself. Thank you for your kind words, Traveller14! Having covered Philippine Airlines' new business class seats earlier this year, we'd naturally like the opportunity to review the product from Sydney or Melbourne (and perhaps also the Manila-Darwin-Brisbane route for a bit more variety), and those discussions with the airline are ongoing. One other comment that many of us will relate too was the observation that the pop music played at midnight was annoying. On airlines like VA the modern rock music they play makes my blood pressure rise. Silence would be preferable! Comment on "Malindo Air Boeing 737 business class, Brisbane-Bali-Kuala Lumpur"